Hand carved Works in Stone : Gravestones, Memorial, Lettering, and Relief Carving. Come out for a day of stone carving, or for the weekend! This class is open to beginners and beyond. For first timers, we'll explore the basics of carving with mallet and chisel as we work through carving a leaf in slate. Or, do you have a small project in mind? Bring a drawing, your excitement, and a lunch, and I will supply the rest; stone, mallet, chisels, and inspiration!! One day class costs: $135. Two days of carving: $260. * There's a limit of 6 students, so contact me soon to register. 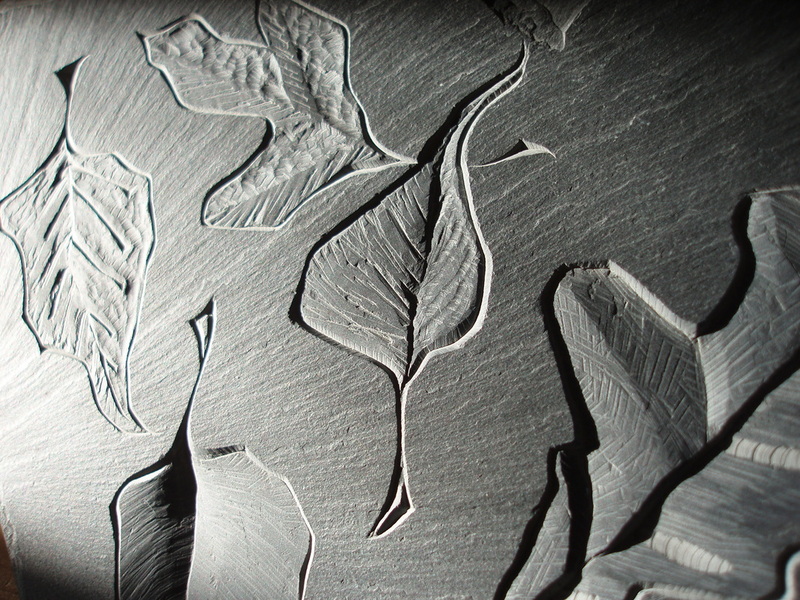 "Leaf in Relief" Stone Carving Class. This is a one day class that will focus on an introduction to the art of relief carving in stone. No experience is necessary. I'll supply the stone, tools and variety of leaves to choose from. You just bring your excitement and lunch! *All tools, material and design assistance included. "Carving a Mask in Relief"
Come explore the many faces of mask carving. Whether it's tribal, abstract, folk, scary, or one that makes you laugh! This 2 day carving class will teach the basics of relief carving as we move along to a finish 6"x6" slate carved mask of your choice or design. This class is open to beginners, as well as folk with carving experience.